The brand new CD from Mad Guitar Records, featuring 17 awesome tracks from a huge range of excellent guitarists. It is the hottest selling instrumental guitar album this year, and is looking likely to be one of the most popular of all time. p+p is £1.99 for UK, £2.99 for international. All currencies accepted! Paypal will automatically convert your preferred currency to £GBP in the checkout. This is a product created by a friend of ours, Tennyson Williams, who by now you’ve probably seen in some of the excellent lessons he’s provided for Shredaholic. 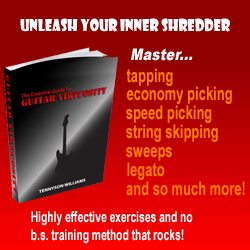 It’s unusual for a downloadable product in that it’s really comprehensive and structured, and will actually help guitarists looking for something a bit more advanced than the usual “learn guitar” stuff out there. The book is pretty huge featuring 24 chapters covering just about every technique you can think of, and the delivery is top notch. We don’t hold any stock of the book since Tennyson has all the payments handled securely by clickbank, so if you click the image of the ebook it will take you over to the product landing page where you should find the option to purchase it. There is a 60 day no quibble 100% money back guarantee, as Tennyson has absolute confidence you will enjoy the product, and you can pay via all major credit cards or Paypal. more exciting new products to come soon!